I spend Quiet Time with God most mornings. (Quiet Time is explained here.) The focus of my time with God today was Genesis 10 and 11 and Psalm 4. God seemed to most speak to me in two verses from the Psalm. (If you would like help in starting your own Quiet Time with God for five days a week, let me know. I'll be glad to point you to resources that will help you do that.) Here's some of what I wrote in my journal today. David seems to be saying that he has learned contentment. He’s not always looking for more; he thanks God for what he has. David is saying that what God has given to him, much of which could not be measured in material things, but in joy, is more than any of the craving rebels will ever have. You can have stuff, power, and success and still not be content, not have joy. Joy seems to not be happiness, but contentment that I have because I live in peace with God, a peace that passes understanding and a peace that never ends. My sins are forgiven. I have been made new (2 Corinthians 5:17). And God is walking with me through everything I experience in life (Psalm 23; Romans 8:31-39; Matthew 28:20). It is this peace that I think David is talking about, a peace not dependent on outward circumstances, but on God alone. Paul isn’t saying that he’s content with the circumstances he’s in (he was imprisoned at the time he wrote them), but that he’s content in the midst of whatever circumstances. I think that David’s sentiments here in Psalm 4:6-7 are compatible with Paul’s from Philippians 4:11. David is trying to convince the rebels to lay down their arms. There is nothing wrong with followers of the God we know in Jesus wanting things: outcomes, situations, etc. But they view everything through the perspective of faith. What they want will not stop them from thanking God for the eternal relationship with Him they already have through faith in Christ. And not getting what they want will not destroy their faith. Listen: Lord, I swing between wanting outrageous things that are clearly not in Your will, on the one hand, and giving up on asking You for anything, on the other. Neither is faith: one is covetousness; the other is resignation. Both are sins, failures to trust in God as God. I allow my thoughts and feelings to shape my faith and moods at any given time, rather than allowing myself to be shaped by what You teach in Your Word. To ask in Jesus’ name, as I have reminded people over the years (and which I need to constantly remind myself), doesn’t mean that Jesus’ name is a good luck charm that makes the request acceptable to God. That would be superstition and attempted manipulation of God. So, to pray in Jesus’ name is to ask God to grant our prayer request only if their consistent with the will, the character, and the intentions of the God we know in Jesus. I take this as a license to go for broke: to ask for anything. But I also take it to mean that, when we sense from God’s Word or the promptings of His Spirit that the things we’re asking for aren’t in His plan, for whatever reason, that we will change our prayers. Even when God says, “No,” that’s an answer to prayer. And, as David reminds in this passage from Psalm 4, the joy God has given us by allowing us to be in relationship with Him is greater than all the good stuff this world has to offer. There are some prayers though that we may pray for long years and even if there is no hint of improvement, we must keep praying them because we know that they are consistent with the will of God. This includes prayers like those in which we ask that God will send workers into the harvest so that new millions will come to faith in Christ (Matthew 9:38); that God will orchestrate the coming to faith of some prodigal we may know (Luke 15:11-32); and that God’s justice and mercy will come to all people (Micah 6:8), to name just a few. These are big prayers and there’s a lot of sin and bad habits and demonic opposition to the fulfillment of any of them. But when I know that something we pray for is in the will of God, I must not stop. Such persistence in praying--driven by love and not by selfishness--is one way I acknowledge the joy that God has given to me through Christ and that I want all people to experience. Respond: Today, let me be intentional in thanking You for all Your blessings, most especially for Jesus. Help me pray for workers in the harvest; for justice for the oppressed--for blacks, the unborn, refugees, women, minorities around the world; for the return of prodigals who have left You; and for me to be a disciple-maker. In Jesus’ name. 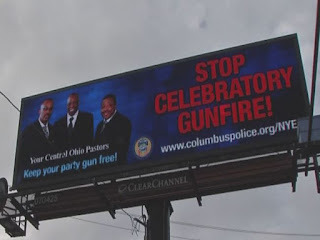 I found it jarring when I was in my hometown of Columbus last week to see a billboard imploring people not to engage in "celebratory gunfire"! Celebratory gunfire? That's a thing in the United States? I remember seeing video of Saddam Hussein and his cronies firing off "celebratory gunfire" several times. But I didn't imagine that anyone would be so stupid as to fire off guns to celebrate in this country. Especially in city or suburban areas, where the chances of harming a child are so great. 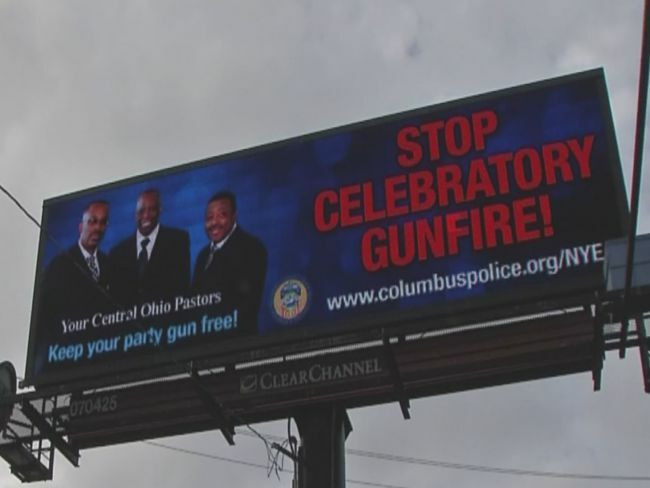 I'm told that there have been incidents of "celebratory gunfire" in Columbus. One of my sisters also told me that she saw an interview with a fellow who lives in Ross County, to the south of Columbus, who said that he didn't see the problem with celebrating the new year by firing off a few rounds. When a reporter reminded him that it was illegal to discharge a weapon in such a way within city limits, the fellow said that he didn't think it was so bad if people did it once a year. He meant, I suppose that when you're happy (and possibly a bit inebriated) on New Year's, it's OK to shoot bullets into the air. Whatever makes you happy, right? Except, of course, bullets have a way of hitting innocent bystanders and what results is something other than celebratory for them and their families. Frankly, I think it's nuts that people would even think to fire off a gun to "celebrate." And the fact that we have to be told that "celebratory gunfire" isn't a good thing is even more nuts! Don't give up on God; God hasn't given up on you! In other words, ancient Israel was called to be a people who trusted in God and told the nations about God so that they could come to trust in Him and follow Him too. While generations of Israelites--or Hebrews, as they are sometimes called in the Bible--thought that being God’s people was all about sharing Abraham’s DNA, that’s never how it’s worked in God’s eyes. Being in relationship with God always depended (and still depends) on one thing: faith. If you read your Bible (or pay attention to your own life), you know that faith in God hasn’t always been exhibited by those who saw themselves as members of the club, whether they thought they were members by birth or by occupying the rolls of some church. The Bible chronicles how God kept working with the Israelites, the genetic descendants of Abraham-- forgiving them, chastening them, shaping them, calling them to faith-- and how most of this people gave up on trusting in God, even when He showed up in their neighborhood in the Person of Jesus. Ancient Israel is no more, of course. The modern state of Israel that bears its name has a citizenry composed of people who are, like their ancient forbears, genetic descendants of Abraham. But modern Israel shouldn’t be confused with the ancient people called to be a “light to the nations.” In God’s time, that role fell to one person, the God-man Jesus. Jesus was the perfect child of Abraham--the perfect person of faith--who, unlike ancient Israel, has cast the light of God onto the entire darkened world and destroyed the dark bonds of death for all who believe in Him. On the cross, perfectly righteous Jesus earned the right to be our perfect, sinless Savior. And when He rose, He guaranteed that those who believe in Him won’t be put to shame by sin or death, but will have everlasting life with God. So, let’s see what happens in the life of the young, new Israel, when Jesus was a toddler, in today’s Gospel lesson. In it, we're given three short narratives from Jesus' infancy, each punctuated by a reference to the Old Testament. Now, what’s interesting about that last line--"Out of Egypt I called my son"--is that, while it’s from the Old Testament and appears in a prophetic book, it’s not a prophetic passage. 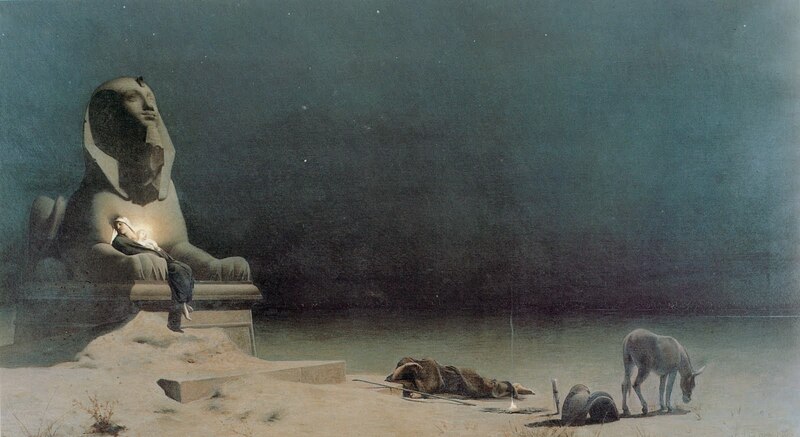 You’ll remember that ancient Israel had first gone to Egypt to be protected by one of its own, Joseph, and to escape the famine the rest of the world was suffering. Later, the Israelites were slaves in Egypt for 430 years. In His time and according to His plan, God called Israel, His “son,” out of Egypt. God the Father protected God the Son Jesus so that Jesus could fulfill the very reason that God had called Israel into the being in the first place, to bring “life and immortality to light.” (2 Timothy 1:10) That happened when Jesus died and rose for us all, Jews and non-Jews. This is the second event narrated by Matthew in our lesson. Herod the Great was, to the extent the Romans allowed it (and they allowed Herod to do a lot), a thug, a dictator. Like Adolf Hitler, Josef Stalin, Mao Tse-Tung, or Vladimir Putin, Herod never hesitated to murder anyone who got in his way. Herod had killed his favorite wife (his favorite wife) and several of his own sons, all, he thought, to maintain his power. So, to Herod it was a no-brainer as to whether he should order those who worked for him to kill all the infant boys below the age of two in Bethlehem. In a town of 1000, which Bethlehem was, this probably meant the death of twenty children. Somewhere among them, Herod was sure, was the Child that the magi had mentioned, a King sent from God; Herod wanted no rivals. The Old Testament verse that punctuates this second account in the gospel lesson is Jeremiah 31:15. This is also taken from the book of an Old Testament prophet. It’s also not prophecy, but remembrance. In it God, recalls how the Israelites who lived in the northern portion of the promised land were, in the mid-eighth-century BC, conquered by a foreign army, the Assyrians. This happened because of the people’s continued faithlessness toward God. God allowed His people to be conquered in the hopes of bringing them back to Him in faith. In connecting the weeping of the mothers of those baby boys in Bethlehem to the weeping of Rachel, the mother of the Joseph of Old Testament times, Matthew was pointing to the human sinfulness that gave rise to each event. The ancient Israelites were conquered and sent into exile because they had repeatedly turned from God, ignoring the calls of the prophets to repent and trust in God alone. The tragedy visited on the families of Bethlehem were the result of the sin of an earthly tyrant who wanted to “be like God.” Yet it all happened because the Child Jesus, righteous as Israel had never been, and, unlike Herod, a descendant of David, had come to save us. The deaths of the innocents in Bethlehem are troubling. But the Savior was saved so that He could save us...as well as the innocents who died on that horrible day. This incident isn’t punctuated by a particular verse from the Old Testament. The prophets never say, “He will be called a Nazarene.” But Matthew is right nonetheless. He presents an Old Testament idea. Take a look at Isaiah 11:1, written about 800 years before Jesus’ birth: “A shoot will come up from the stump of Jesse; from his roots a Branch will bear fruit.” Jesse was the father of Israel’s King David. The Messiah King would be a Branch--in the Hebrew, the word is nezer--of David’s family tree. Some scholars see a connection between that word for branch and the name Nazareth, which my mentor Pastor Schein used to call, appropriately, Sproutville, the place where the Branch of Jesse, the Messiah King Jesus, sprouted and grew up to be our King. What does this all have to do with you and me? When I was a young boy, we lived in a part of the city called the Bottoms. Whenever it rained, my neighborhood mates and I would go out to the kerbs and build dams made of grass, mud, and sticks. We'd build one dam after another to thwart the flow of the rain water. But while we could divert the water, we could never stop it. The water always found a way off of the street and into the sewer traps. God is like that water. Puny human beings, like Herod or, sometimes, you and me, or faithless ancient Israel, may make a fuss for a while. We may get in the way of God’s grace and new life reaching people. We may take ourselves on side-trips into sin or even turn from God altogether. But God will not be thwarted! He will fulfill His purposes. He will do what He sets out to do. Even using faithless Israel as the means by which He brought the Messiah into the world! It’s good to know that God doesn’t give up on us! He sent His Son when all hope seemed exhausted. And when Jesus had given His life for us on the cross, the Father raised Him up: to give the hope and the certainty of His presence with us through all this life and on into eternity for all who believe in Christ, God in the flesh! God always finds a way to deliver His grace, His love, and His help to those who trust in Him. Even when Israel was faithless, God was faithful to all that He had promised to Israel and to us! He’ll be faithful to you too! Whatever is wearying you today, you have God’s promise that He will not give up until He has helped you and given you new and everlasting life. God’s love is tough: Don’t give up on Him because He will never give up on you! It's the Eighth Day of Christmas. Here's the Pentatonix acapella wonderful take on a classic Christmas hymn.